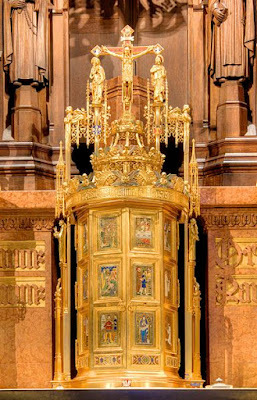 "In the presence of Jesus in the Blessed Sacrament, I invariably find something that the world always hides from me, namely knowledge of self. In the light of the Holy Eucharist all my faults and failings and all my sins, past and present, become clear to me; and then from the depths of my heart there wells up a cleansing, purifying fount of sorrow. Oh, how poor and miserable I appear to myself when in the presence of Jesus! And yet how sweet and salutary are the tears that I shed at the sight of transgressions! If I cannot find it here, then where in the world can I find it - a little patch of earth. I mean, one to be watered by tears so that there the blossoms of hope may grow? ...In vain do the fallen look for comfort and consolation from the proud ones of this world; they receive naught but the humiliation of contempt. Jesus alone knows how to extend to the fallen who are trying to rise again the helping hand divine. Jesus alone gives unto them the kiss of renewed friendship. The tabernacles of sinners are no longer for me. To find peace, I must share my dwelling with Jesus."